Let’s make a deal. For every naughty treat I post, I’ll post a nice one, ok? I might have made you Gooey Butter Cake Cookies that will single-handedly be responsible for some holiday weight gain, but then I made you Chocolate Peppermint Mousse with Greek yogurt as an apology. My apology for those Candy Cane Cookies that you will probably steal from Santa is these popcorn balls. Popcorn balls are a little old fashioned, yes, but we need to bring them back. I think we’re allowed to consider popcorn a whole grain these days. So, rolling with that tide, I used natural sweeteners (maple syrup and brown rice syrup) to make a sweet and sticky popcorn ball that you’ll feel good about bringing to a potluck. Holiday parties and potlucks this time of year can seem like calorie warfare. There are too many desserts on the table that are often a mishmash of two or more desserts, thus quadrupling the calories. Oreos stuffed inside anything else–I’m lookin’ at you. 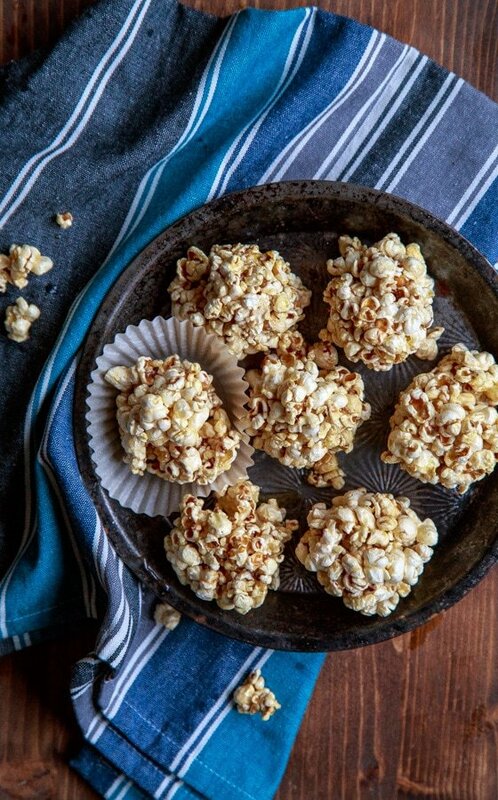 So, if you have to bring something to a dessert potluck, these light popcorn balls sweetened with brown rice syrup and maple syrup are just the thing to keep you out of trouble. They don’t taste naturally-sweetened at all, I promise! If you can pull off holiday sprinkles, you could add those for some festive flair. I had ‘festive sprinkles’ on my grocery list, but somehow never followed through. But, I think these popcorn balls are still pretty on a festive holiday plate. You can also stir in nuts, mini chocolate chips, cinnamon, whatever your little heart desires. Have fun with it! If you’re having trouble locating brown rice syrup, go to the natural foods section of your store. It’s usually by the natural peanut butters and coconut oil. I’ve only ever seen one brand. Here’s a peek at the Lundberg Family Farms jar to guide you. It’s usually about $6/jar, but I get two full-sized desserts out of one jar. I use brown rice syrup frequently to make Heidi’s naturally-sweetened rice crispy treats, so I’ve managed to find it in almost any store. Sometimes, I have to request that the store carries it, but they’re usually more than happy to bring in a new product. You could just let the popcorn dry on a sheet and munch on it like caramel corn, too. But I think it’s so fun to wet your hands and form little balls out of it. Plus, I hear that kids like to do it too, but there’s just something about little sticky fingers that makes me nervous. You probably have more patience than me. Kids or no kids, I think you’ll love this old-fashioned holiday treat. In a 4-quart saucepan, add the oil and popcorn kernels. Place over high heat and cover. Shake the pan every so often to distribute the kernels evenly over the heat. Once the kernels start popping, lower the heat slightly and listen for the popping to slow. When it slows, turn the heat off and leave covered for a few minutes to finish popping. Meanwhile, spray a large bowl with cooking spray. Pour the popcorn into the bowl and pick through to remove any stray kernels that didn't pop. Rinse out the pan that you popped the popcorn and dry it. Return it to the stove, adding the maple syrup, brown rice syrup and salt. Turn the heat to medium-high and bring to a boil. Let the caramel stay at a rolling boil for 4-5 minutes; it will slightly thicken. Remove from heat and stir in the vanilla carefully--it will splatter some. Pour the caramel over the popcorn in the bowl and stir to combine. 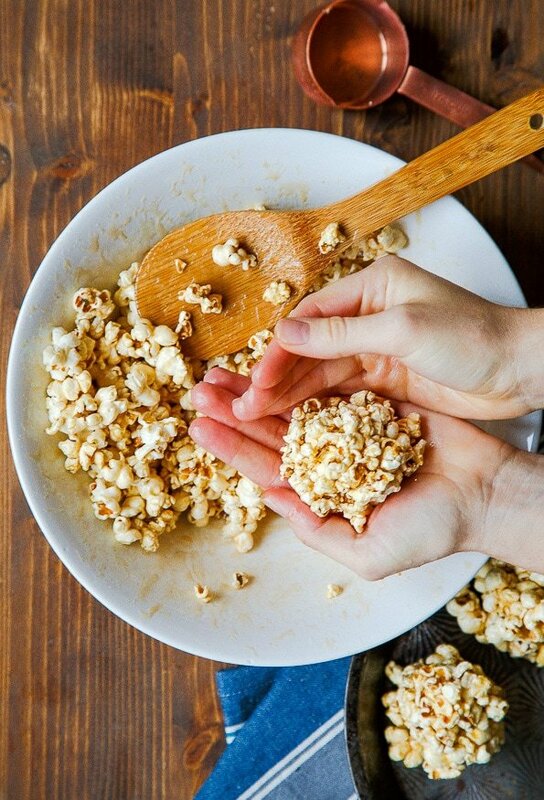 Wet your hands and form balls out of the popcorn about the size of tennis balls. You will get 9 balls. I adapted this recipe from Heidi's Spiced Caramel Corn in her first book, Super Natural Cooking. these look good! also, if you are looking for adorable holiday sprinkles in st. louis, i highly suggest checking out urzi’s italian market on the hill… they have an amazing collection of sprinkles! haha, Jennifer! 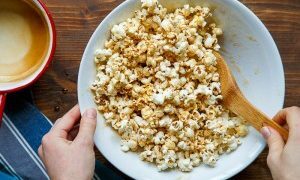 I had to make this recipe again last night to be certain of the yield because I kept eating the popcorn straight from the bowl before rolling it into balls! So tempting! I totally agree – popcorn balls need a comeback! My grandma used to make the stickiest, most delicious popcorn balls every year for us kids, but seeing as she’s 96 years old at moment, we haven’t seen her homemade popcorn balls in years, and I miss them! These totally take me back! i have a major addiction to caramel popcorn so i could definitely use this for a change. This is one I will be doing over the holidays with my daughter. Sweet. It’s all about the balance. Love these popcorn balls with all my heart. Pinned. i love popcorn balls, they are so festive!!! 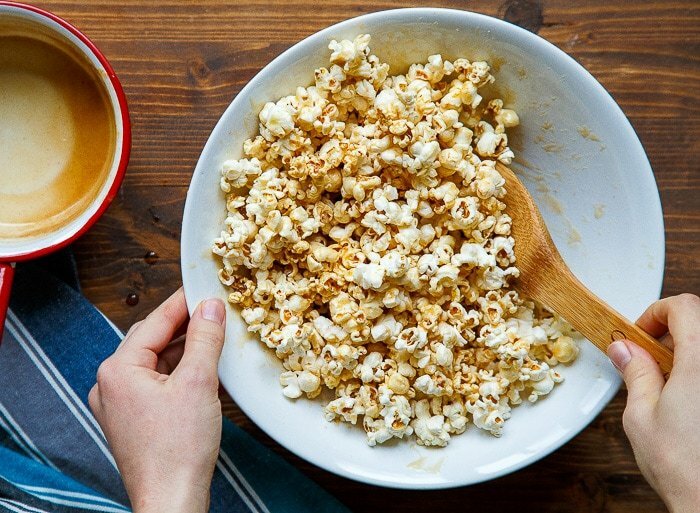 I have no doubt this would be a hit in our house – how can you go wrong with caramel and popcorn? I love caramel corn and popcorn balls! Great idea for an edible gift too…yum! This looks so good!! Yum! I’m a sucker for old fashioned things. Reminds me of being in the kitchen with my granny! Once I can get my hands on some brown rice syrup, I’m going to give these a try. Sprinkles or not, they are pretty darn cute!